"Glorified (and Exalted) be He (Allah) Who took His slave (Muhammad salla Allahu 'alayhi wa sallam) for a journey by night from Al-Masjid-al-Haram to the farthest mosque (in Jerusalem), the neighborhood whereof We have blessed, in order that We might show him (Muhammad salla Allahu 'alayhi wa sallam) of Our Ayat. Verily, He is the All-Hearer, the All-Seer." [Surah al-Isra 17:1] The Night Journey and Ascension "are two incidents from the greatest incidents in the noble history of Muhammad (salla Allahu 'alayhi wa sallam)." However the mode of these incidents has been debated over the years: Did they occur in a dream? 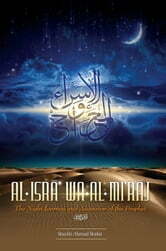 Was his (salla Allahu 'alayhi wa sallam) soul removed and taken to the heavens while his body remained on earth? Or did he ascend in his whole form (body and soul)? 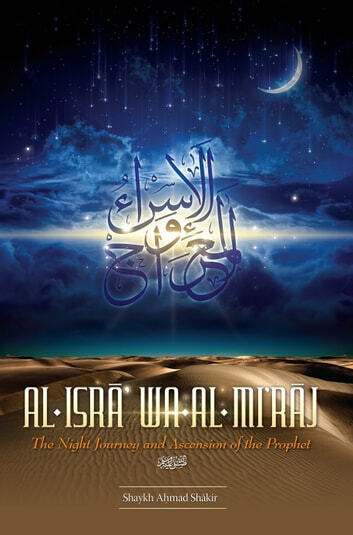 Shaykh Ahmad Shakir puts this issue to rest with a thorough review and explanation of the ahadith which have been transmitted regarding al-Isra wa-al-Mi'raj; the different transmissions and the errors in them; and a refutation of those who discount these miraculous occurances as unscientific and therefore untrue.